I know what you're thinking, what kind of crazy am I to go on a 4-hour-each-way road trip 2 days before leaving the country to go to Ireland? I'm the BBQ kind of crazy, that's what kind of crazy I am. I made a commitment to Tim Lively to judge the Real Squeal in Lyons, GA and I was not about to let him down, because he is one of the nicest men in KCBS BBQ that you will ever meet. Of course, if I was going to drive all the way to Lyons, I might as well go the extra hour or so and spend the night in Savannah. Extra incentive? My friend Toren Anderson wanted me to check out the food at her client Leoci's Trattoria and you know I'm a sucker for good Italian food. I am so glad I went the extra mile or 80, as it was a fun weekend, full of excellent food. I went straight from Lyons to Tybee Island and caught the last 2 minutes of the Pirate Fest Parade full of pirates and wenches and canons, oh my! 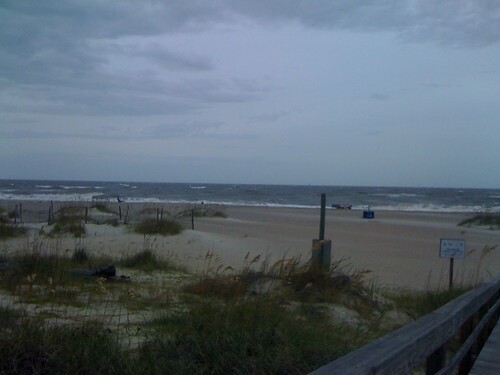 I wanted to go to the beach, but it was unseasonably windy, so it felt a little like having my skin sand-blasted from my body. I gave up on that plan and instead rendez-vous'ed with Toren and her adorable son Aidan, who is going to change the world, watch out for this one. After a fun island tour, including amazing fried shrimp at Gerald's Pig and Shrimp, plus fantastic cocktails and sushi at Ele, I headed back across the bridge to my home for the night, the Westin. 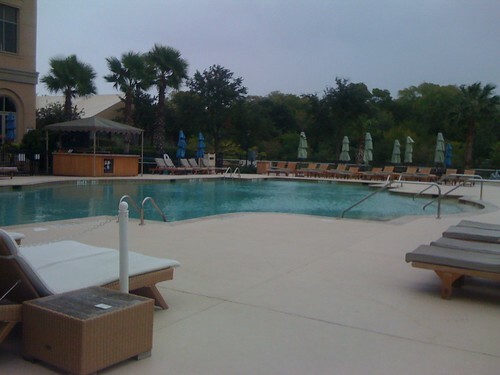 I know the staff there thought I was crazy when I woke up early the next morning to go swimming in the chilly rain, but they have an excellent pool, so I had to do it. After my swim, I cleaned up and took the free riverboat across the river to Savannah and wandered around a bit until it was time for my much-anticipated brunch at Leoci's Trattoria. When I pulled into their parking lot, my eye was immediately caught by their inviting outdoor eating space and I knew I had to sit outside, even though the sky looked like it was threatening to rain. 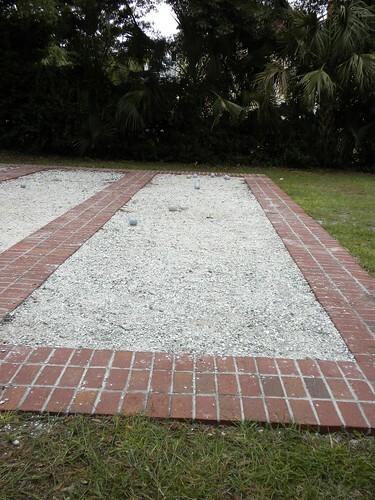 If I had not been by myself, I would have loved to play a few games on their oyster shell bocce courts. I'm betting this is a very popular spot to get together with friends and have a few drinks on a warm summer evening. I was incredibly fortunate to be hosted by Roberto Leoci, who brought me more amazing food than I could possibly eat, but I did try my best. 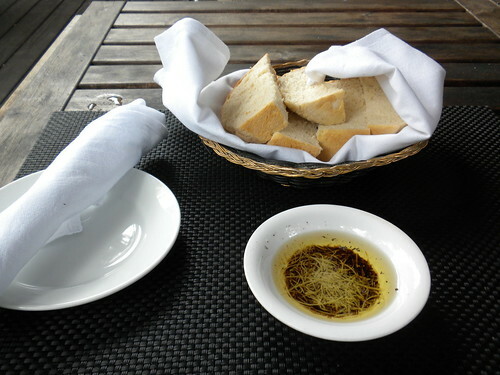 If they didn't bring out that delicious, hot bread with olive oil & balsamic dipping sauce, I would have been a lot better off. 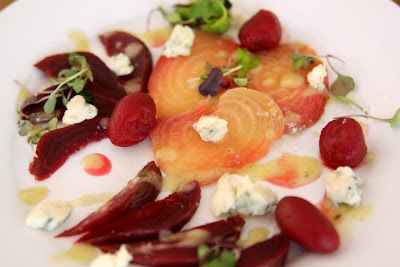 I started off with the beet salad, which was one of my favorite courses. Roasted beets, pickled beets, blue cheese from Flat Creek Lodge and micro-greens, it was sweet, tangy, earthy, salty goodness. After the beets, I had a meat-centric plate of incredible provolone and wine stuffed sausage on a truffled arugula salad, pork loin topped with more Flat Creek cheese and house-made onion jelly, with jalapeno-raspberry jelly on the side. My pasta course was Rigatoni with Cod in a Saffron cream sauce made with Swiss Dairy cream and Savannah River Farms pancetta, which is cured per an old Leoci family recipe. Roberto said they may be shipping the pancetta soon and trust me you want to add this to your shopping basket, it is soo good! Dessert was a peach basil cobbler with a crust unlike any I've ever tasted. It was almost like a short crust, so buttery and good. I would love to have the recipe for this, maybe if I beg? I was lucky that they were having a bit of a slow day so I had time to chat with Roberto about his fine arts background, cooking in Italy and what it is like to work with the likes of Alain Ducasse and Charlie Trotter. Despite coming to the cooking relatively late in the game, this guy has chops, and a really artistic eye, as is evidenced by his gorgeous plates. What an awesome trip! 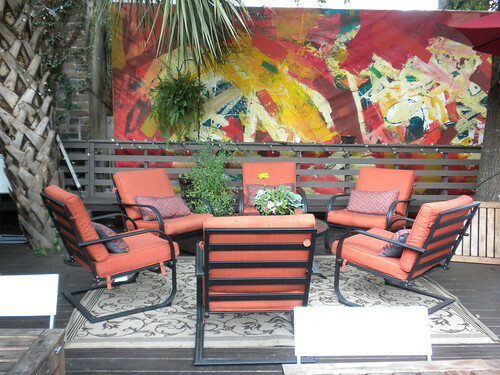 I LOVE the picture of the outdoor dining area! The chairs look almost as nice as your chair planter!!! Hi Emily! My wife and I are going to Savannah for a vacation! We're definitely going to follow your recommendation and check out Leoci's! Missed Leoci's when we in Savannah last month! :-( We did eat at some great places and go on a midnight "ghost" tour AND see the St. Patrick's Day parade!